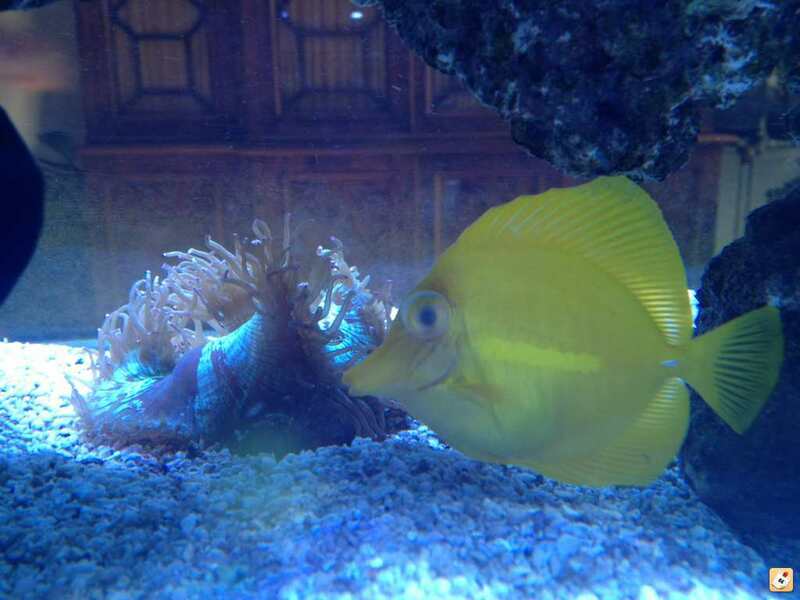 Bought a Yellow Eye Tang from my local LFS and after getting him home my wife notices he has one bulging eye. Oh goodie! Not too familiar w/ Tangs but I have him in a QT and otherwise he seems fine. Is there some treatment I should be doing for this? What is this? I do not even know if this is a serious problem or not. Is it an injury? So here's the full update on the Kole Tang: His eye has returned and remained normal for several days now and has as of yesterday started eating Mysis. Yeah! His coat is good and shiny and I believe he is going to make it swimmingly thru the QT process. Does it look like this? Could be Popeye. You can treat for a secondary bacteria infection with antibiotics, but it can go away on its own if the fish is healthy and has a good diet. I'd give it a day or two before I considered sticking it with a needle. Have you talked to the LFS where you purchased it? I was referring mostly to his advise of just trying to let it heal on its own and that the use of antibiotics was mostly unneeded unless injected in the void behind the eye. No I have not talked to LFS yet but will do so not for any kind of refund but to address some issues with e purchase of the two fish. What I haven't mentioned is the other fish was DOA in the bag and never made it to the QT. I tested the water prior to acclimation and it was so hypo salinity it barely registered on my refractometer. Somewhere far below 1.015, but my meter doesn't scale that low. I believe this stressed the fish too much trying to acclimate them up to 1.023. I called during the acclimation and was told that this was basically impossible. I assured them my refractometer was freshly calibrated and triple checked for insurance. But threy said keep going anyway with the acclimation. The wrasse did not make it an hour and the Tang got so lethargic I went ahead and placed him in the QT. He is still alive but with the popeye and not eating. I have had multiple fish over the years get pop eye. Almost always, with time it will go away. Try to keep the stress down and make sure to feed it good. For what it's worth-what I have read about pop eye is that if it is in 1 eye, it is usually from some kind of injury or scrape. If it is in both eyes, it is usually from some kind of disease/illness. The Tang's eye has returned to normal for 2X days now, but still not eating garlic infused Nori. I have tried rubber banding to plastic pipe and the vege clip method. The LFS replaced the DOA Wrasse and he seems to be doing fine in QT. Eating well and swimming all day.